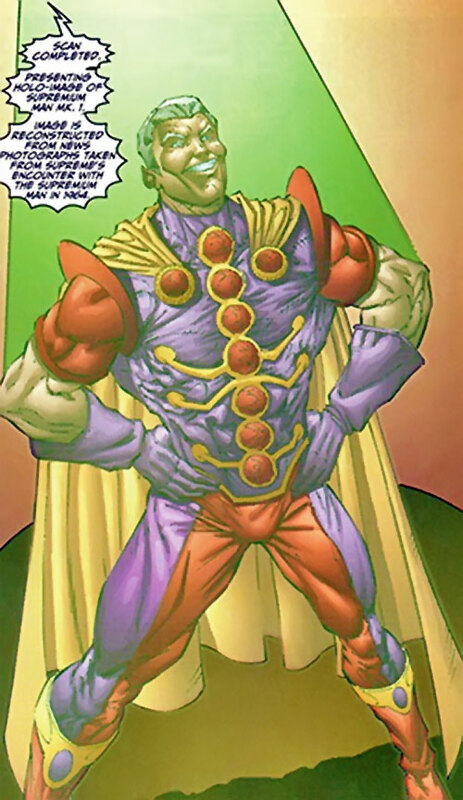 The original Supremium Man appeared during Alan Moore’s run on Supreme, in 1996/97. Supreme was just a so-so Superman expy , but Moore’s run became a celebration of the best aspects of Silver Age Superman storytelling. It was quite good. The Kryptonite-themed Supremium Man was a good example of his approach. Real Name: Unrevealed alternate universe teenager & Billy Friday. Other Aliases: Meteor Master, Supremium Man I. Group Affiliation: Ex-worker at Dazzling Comics, temporary partner of Darius Dax. Height: 6’0” Weight: 190 lbs. The Supremium Man employs powerful Supremium meteorites for a variety of effects. He was originally a teenaged scientist from another dimension and after he fused with Billy Friday, he was also a somewhat competent writer. He is a scholar of the Supremium element as well as a collector. The Supremium Man is good at comic book tough guy dialogue. During the 1930s Supreme had his first encounter with a white-haired teenager from an alternate universe. This youth was collecting Supremium meteors. Supremium is an astounding element that has the ability to bend time and reality, and the teenager sought to control these dangerous abilities himself. In 1964 the teenager had become a grown man, calling himself the Supremium Man. He met Darius Dax in the body of Magno, an old foe of the Allies. Supremium allowed the Supremium Man to travel through time and space in search of further meteorites. Therefore, he surfaced in different time eras and not necessarily in chronological order. His time travel created loops in time. Therein, certain events affected each other into creating themselves. Due to the careless actions of Darius Dax, these travels led to the creation of Supreme, Suprema and Radar. They would also temporarily turn Dax into the second Supremium Man, and eradicate all fragments of Supremium from existence from most time eras. In modern times, one Billy Friday was the editor of Omni-Man (no relation) for Dazzle Comics. During a visit to Supreme’s flying fortress he was exposed to Supremium. Soon his limbs started fragmenting and he thus grew fast in size. The only way of stopping him before he would have crushed the Hell of Mirrors, Supreme’s prison for his most powerful foes, was to turn him into light. He was then sent to Amalynth, the world of light. While there, Friday still faxed the office every day with his latest writing. While in Amalynth, his genetics stabilized. However, he had an argument with Szazs, the Sprite Supreme, and was banished to the 19th dimension. From there he was rescued by Emerpus, the reverse Supreme, which landed Billy in the Backwards Zone. Soon, Emerpus got sick of his presence and returned him to Earth, but in the wrong century. Billy ended up in 2496 AD. He stayed with Zayla Zarn, aka Future Girl of the Legion of Infinity. During this period, his faxes to the office were a little more unbalanced. 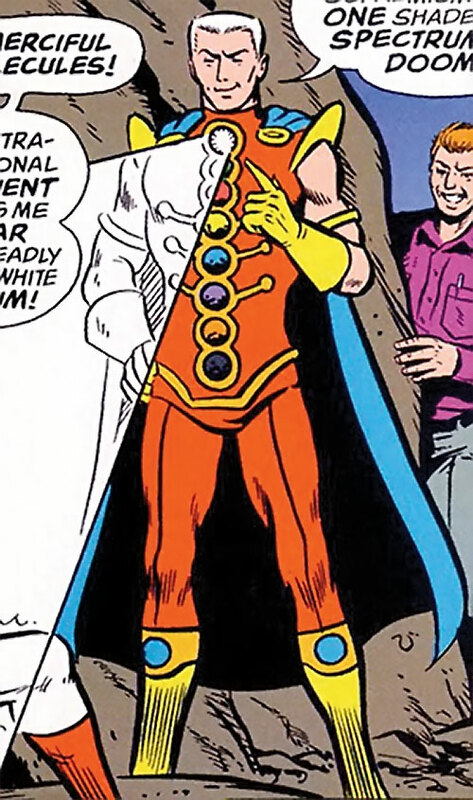 The Legion of Infinity was summoned to the 1990s by Supreme. They were to combat the threat of a recently resurfaced Darius Dax. Billy joined them and arrived at Supreme’s flying headquarters. There he was briefly exposed to Supremium that Dax was handling, and his growth mutation resumed. The assembled heroes, in order to avoid him destroying the fortress, promptly banished him into the Hell of Mirrors. Eventually the mutation receded again and Billy met up with the other criminal inmates. The criminals couldn’t stand him and so they asked Supreme to take him away. Billy was released and became an inmate at the Miskatonic Asylum. His laptop communicator was left behind. This later allowed the Mirror villains to escape using the powers of the Televillain. 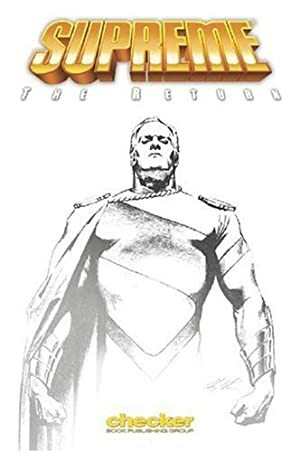 When Billy was finally released from the asylum, he returned to his work at Dazzle Comics. At the very same moment as Supremium Man attacked the city. The Supremium Man sensed that Billy had been exposed to Supremium. Meanwhile Billy touched the Supremium Man in an attempt to bond. The two fused to became a new Supremium Man. The merged being realized that he must be a supervillain. He used his Supremium collection to travel back through time when Supremium still existed, thus closing a loop in time. While his personality was Billy’s when he left, it was the alien’s when he arrived. In 1930 and with Darius Dax’s help, the Supremium Man found the last missing piece to his collection – white Supremium. He hacked off a piece of the meteor and slotted it into his costume, turning his hair stark white. He then used white Supremium on the arriving young Supreme. All of his fragments activated against his well. This produced a violet light that restored Billy’s memory. Billy promptly left to seek vengeance against Supreme. He opened a portal to Darius Dax’s lab in 1997. From there he attacked Supreme at Dazzle Comics, where he encountered a visiting Billy Friday. The Supremium Man fused with Billy again, thus burning out the White Supremium fragment. Then he left for the 1930s to get his missing White Supremium fragment, completingthe time loop. He has not been seen since. The Supremium Man wears an odd costume of, apparently, alien origins. In earlier time eras his costume had seven slots for meteorites, while later it had only six slots. This might be an effect of reality rewriting itself when Supremium is being used. Reality itself (and everybody’s memories) seem to have adjusted to the Supremium Man having always been a fused entity. The Supremium Man was obsessed with collecting Supremium. He was well-versed in the mineral’s powers. He readily used them to further his goals for getting further meteorites. Billy Friday he was an overbearing comic book writer. He loved pretentious popular cultural references and absurd storylines. Few people could stomach his odd personality. The fused personality showed fragments from both their personalities. At times one personality would dominate the other. But in general there wasn’t much conflict, nor did they have a sense of something being genuinely wrong with their personality. The fused Supremium Man is clear-headed enough to realize that he can’t mess with the timeline too much. He knows he’d risk destroying himself and his origin in the process. The result is a raving, unstable personality that wants revenge on Supreme for having ruined his life and mental health… and to complete his collection of Supremium. If things don’t go his way, he will readily jump into another time era to try out something else in pursuit of his quest. The Supremium Man is an apparent homage to Silver Age Superman’s enemy Kryptonite Man. However, his powers are much more varied and unique. As to Billy Friday, is a homage to Jimmy Olsen. 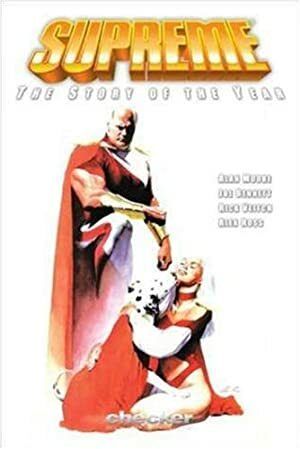 Thus, use either the Silver Age DC Universe in its entirety or Moore’s Supreme Universe, possibly as a parallel world, with its small differences and twists of these classic characters. Darius Dax (Low), Dazzle Comics (Low). Distinct Appearance (odd garments, pointy ears), SIA (Collecting Supremium), Serious Psychological Instability, Unluck. All the Supremium in the world ! There are eight different types of Supremium, or is that seven? These are Emerald, Ruby, Onyx, Topaz, Sapphire, Amber and White meteorites. Together they can temporarily fuse to produce Ultraviolet Supremium. The Supremium Man has, at times, a full collection of all the basic meteorite types, only sometimes lacking White Supremium. White Supremium – the most powerful Supremium of them all. White Supremium is what granted Supreme, Suprema and Radar their superpowers (Bestow 40 or so with most Bonuses and R#5, failure indicating that the meteor has burned out). In its current state its radiation can kill Supreme as per a standard Fatal and Loss Vulnerability. White Supremium also tries to bond with other types of Supremium, which resulted in the Supremium Man and a previously Supremium-affected Billy Friday fusing into one individual before it burned out that white fragment. Thus using White Supremium is very dangerous as it seems to have a will of its own; it will also activate all the other Supremium fragments in the costume, producing Violet/Ultraviolet Supremium light. Violet Supremium, which retains the R# in relation to the White Supremium Fragment, affects the mind severely and cures amnesia among other things. Emerald (Green) – promotes growth in organic life (at least Plant Growth: 12). Ruby (Red) – transmutes matter (at least Transmutation: 15 w/Bonus useable against organic targets (+2) and Transform: 21 w/ Bonuses Humanoids Allowed (+1), Can assume Imagined Animals and objects (+2) and the Limitation only useable against others (-1)). Onyx (Black) – erases time (game effect unknown, but at least a few APs of Time Stop are likely). Topaz (Light Blue) – unknown effects. Sapphire (Purple) – affects probabilities (at least Probability Manipulation: 15 and Super Breath: 08 w/the Indirect Bonus (the target breaks or gets knocked off balance with no visible cause) (+3). Amber Supremium – alters time (Time Travel: 40)]. Source of Character: Supreme comics (Awesome Comics). Writeup completed on the 5th of December, 2010.